What is website accessibility anyway? Wikipedia says that “Web accessibility refers to the inclusive practice of removing barriers that prevent interaction with, or access to websites, by people with disabilities. When sites are correctly designed, developed and edited, all users have equal access to information and functionality.” So basically, make your site available to as many people as possible. Accessible Mega Menu for the main menu of the site. After first evaluating half a dozen menu modules for accessibility and then a failed attempt at creating a module that uses Dylan Barrell’s WAI-ARIA menu from his A11ify library, the Accessible Mega Menu module proved to be a good compromise. This module integrates Adobe’s Accessible Mega Menu (no relation to Drupal’s Mega Menu module) into Drupal. It didn’t have all the features of a WAI-ARIA menu but did allow a person to tab through just the parent level menu items and expand and access the child level items only when desired (as opposed to forcing keyboard-only users to tab through every single menu item). Share buttons for Drupal including the AddToAny universal share button, Facebook, Twitter, Google+, Pinterest, WhatsApp and many more. Inspired by Block Class, this module adds additional elements to the block configuration forms that allow users to assign a ARIA landmark role to a block. Provides a quick solution to allow the user to switch between the active theme and a high contrast version of it. This module tidies Drupal's HTML output with HTML Tidy by optionally sanitizing it when it is saved or when it is displayed, like a traditional input formatter. Missing and mis-ordered tag components are replaced and reordered automatically so that user input doesn't break site structure with open tags and the like. This module is designed to help copywriters and editors develop more consistently readable content across a Drupal site. It performs five popular automated readability tests that provide a grade level equivalency of the difficulty of a page's readability. It enables you to set a target grade range for your site's content. Adds a block to allow users to switch between enabled themes. Themes can be given 'user friendly' names and access can be controlled by user role. Switchtheme provides optional support for Browscap module to switch themes based on the browser of a visitor. The Text Resize module provides your end-users with a block that can be used to quickly change the font size of text on your Drupal site. This module is primarily focused on increasing the accessibility of your pages, by helping visually-impaired users to adjust the text size so that it is most comfortable for their eyesight. 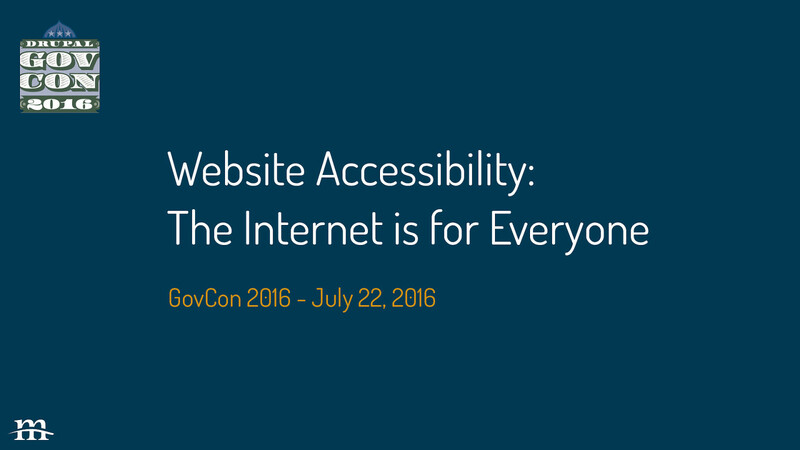 View Website Accessibility: The Internet is for Everyone on Notist. Website accessibility matters! There are many reasons to make your site accessible - not only will incorporating accessibility into your daily lives help people with disabilities actually be able to use your site, but it can help attract a wider audience/larger customer base, make your site rank higher with search engines, and can improve your overall user experience on both desktop and mobile devices. But how can you make your site accessible? Website accessibility is often an afterthought at the end a project when there is an accessibility audit or a user submits an issue, but what if we switched focus and started thinking about accessibility at the beginning of a project during the initial design and development stages? In this talk I will present a quick overview of website accessibility (the what, who, and why), then review the underlying guidelines to making a site accessible, and present some general rules to keep in the back of your mind while designing and developing your next site. Finally, we will review some current D7/D8 modules that can help you make your site accessible. Link to the actual event.